1. Download, print and complete this booking form with names of all to be included in your payment. Make your cheque payable for the "total" to: Great Alne Folk Festival. 2. For confirmation of receipt, please include your clearly legible telephone number and email address. (Please note: In the event of unforseen circumstances, this "Early Bird" payment is not normally refundable. This bargain "Early Bird" SeasonTicket is issued for ALL of Gt Alne Long Weekend. If visiting though, you are equally WELCOME to come to any part of this long weekend of folk dance, music & song. You're asked just one price to partake in any whole daytime series of workshops. Similarly for an evening. All one price. Workshop before music start-up, through a whole evening's varied dancing. We hope thus, you will try many kinds of dance. (Do things you've not done before?) Perhaps try making music too. Children under 10 years are free throughout (if accompanied by a paying, participating supervisory adult). The Maypole, the Border Morris and the Handbell Ringing make mid Saturday & mid Sunday ideal for visits. Please come-inside & sign-in. Just make a fair contribution to our cost of hall hire. We would request £3 per participating adult for a single workshop session. 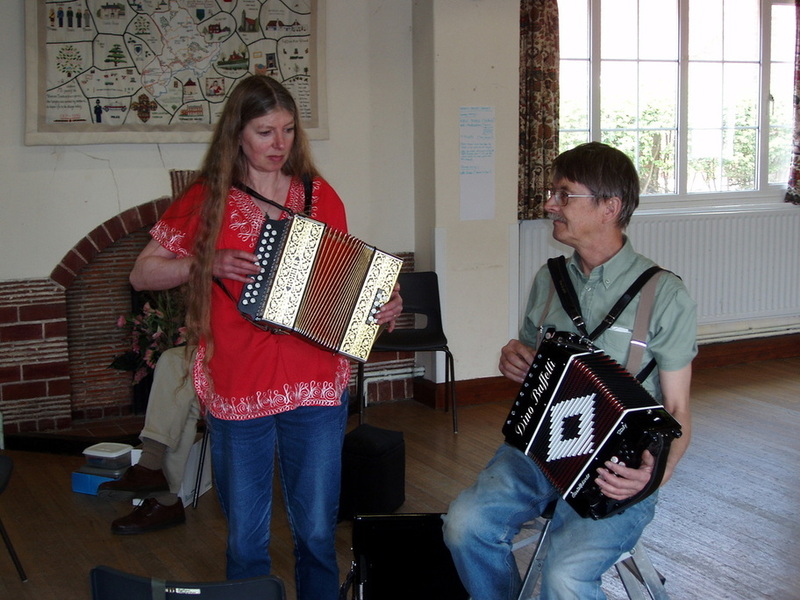 (To encourage their young people in folk activities, any accompanied 10 to 16's are £1 per workshop session ). If visiting supervisory adults prefer watching your under 10 child then £1 per child per workshop is appreciated. We wish thus to pass on the active traditions of folk dance, music & song. Full Season Ticket over the weekend. We hope these prices and workshops encourage participation of young people, yet leave most of the evening for adults to dance. Please bring along as many young people as you think may be interested in the folk fun, most especially in the middle of the day. We are very appreciative that senior citizens are in general, pleased to contribute in the "adult" category. This greatly helps to pass-on the joy of folk music and dance to a younger generation. We hope next year to provide a small bonus to show appreciation to all who have bought any 2012 Season Ticket. An occasion here with the hall otherwise unused, allows an informal chance to play music. Lorraine and Mike enjoy making music together.